This is going to be a fun way to show your Team USA spirit! We are excited to offer quilting challenges and events for you to participate in while watching and supporting our Olympic athletes who are competing in the XXII Olympic Winter Games in Sochi, Russia! Each event will have medals and points awarded and will take place during a specific time period either at home or at the shop. At the end of the Quilt Games, points will be tallied and prizes awarded for overall first, second and third places. Visit Wendy, Andree and Laura Kay at the Heart of Texas One Stop Shop Hop in Waco, Texas, this upcoming weekend. Friday, Jan. 31, from 10 a.m. - 5 p.m. and Saturday, Feb. 1, from 10 a.m. - 4 p.m. you can shop to you drop at 31 different quilt shops located in one building! Of course, we want you to stop by and see us. Early sign up ensures the class will have enough students for the class to make. Let's learn how to put the finishing touch on your quilt...the binding! This class will teach you how to bind a quilt. It will cover straight, bias, 2 color binding and much more. Janet will be sharing Meg Hawkey's technique for coloring Crabapple Hill stitchery prior to embroidery. We find her designs so appealing and ingenious. Now Janet will crack the code. Have you always wanted to make a Buggy Barn Quilt but were afraid of the technique? This class is for you! In this 3-hour workshop, Rachel walks you the creation of a Buggy Barn quilt, how to select the fabric, stack the fabric, draw the template, cut out the block, and sew it together. 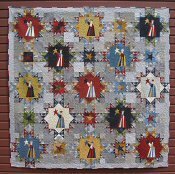 Learn how to Make the amazing Lady Liberty quilt from "Crazy or Not". In this class we will discuss how to stack the fabric, how to make the template, cut out the block and then sew it back together. We will discuss different settings to use this block to make a quilt. 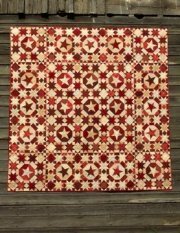 Learn how to construct one of a kind quilts from one simple shape that make unique kaleidoscope quilts. One fabric does all the work! Fair warning - it can become addictive! Janet will be sharing Edyta Sitar's technique to create these beautiful dresdens. You will learn to rotary cut and machine piece the fans and invisible machine applique. Once again we are offering Jo's Little Women Club. We are so excited to offer Club 13! We heard from Jo that this one features Dovetail Batiks in some projects. Join Penny for this fun machine appliqué sit-n-sew on the First Tuesday of every month. 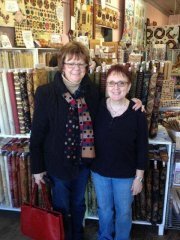 This is a fun group and Penny is there to answer your quilting questions. Meets 1st Thursdays 6-8 p.m. or 2nd Mondays 12-2 p.m.
Join M.J. once a month for Tips and Techniques with an Expert. 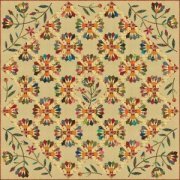 Each month this award winning quilter will share a valuable tool or technique to produce beautiful quilts that you are proud to show. She will cover all aspects of quilting. Join Jill for another year of a fun sit-n-sew group where she guides you through wool appliqué and embellishment projects! Explore Carolyn's chosen topic and see several examples from her vast collection. She will encourage questions and you are invited to bring a quilt to share for 'show-and-tell' at the end of the sessions. The January meeting was a huge success. Everyone learned so much about Civil War quilts and had a ton of fun. Space is limited to 15 attendees. 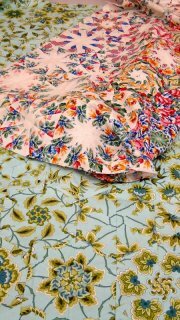 Have you always wanted to make a Kim Diehl quilt, but didn’t know where to start, or the patterns looked too involved? In this twelve month club, meeting the 3rd Saturday of every month, we will complete one of her projects per quarter. What a great way to start the year, make new friends, learn new techniques and make a Diehl!! 10 a.m. - 1 p.m. or 2 p.m. - 5 p.m. 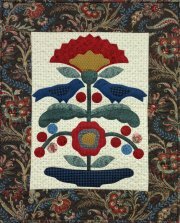 The Quilted Crow Girls have a unique design approach based on vintage quilts and historical motifs but made up in wool. They have a fun wool applique technique that we want to share with you. They have told us that they are designing a project just for us! Deirdre and Leonie own an adorable shop in Tasmania and since we can't all go there, we are bringing them to you! Details to follow. We'd love to have your feedback on what class topics you'd like for her to offer. Details to follow. What topics are you interested in learning about from Harriet? Machine Quilting? Quilter's Academy 1, 2, 3 or 4? Let us know. Learn to applique with attitude the Piece O' Cake way! Your stitches not only hold the applique in place, but they also embellish as well! The edge of the applique is needleturned and sewn with perle cotton. This applique method is fast and fun and very cute! You will cover three different stitches in this 1-day class suitable for all skill levels. 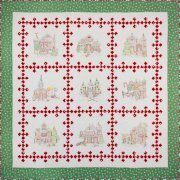 The pattern for the 10"x10" mini quilt is included. Learn the hand applique techniques that will help you sew better and happier. In addidtion to easy template making and how to make and use applique placement guides, you will perfect your invisible applique stitch as you work on your block in class. Stitching techniques include 2-point leaves, cutaway applique, outer points and the invisible stitch. This class focuses on applique techniques. You will work on one 14"x14" block. The pattern for this quilt is included. This 1-day class is suitable for all skill levels.